Figure 12-8. - Wheel alignment rack. 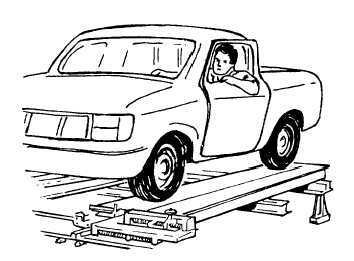 To measure alignment angles, you will need special equipment, A wheel alignment rack (fig. 12-8) would be ideal. It positions a vehicle so that you can take measurements accurately and easily. However, it is doubtful that you will find such a setup in the battalions. 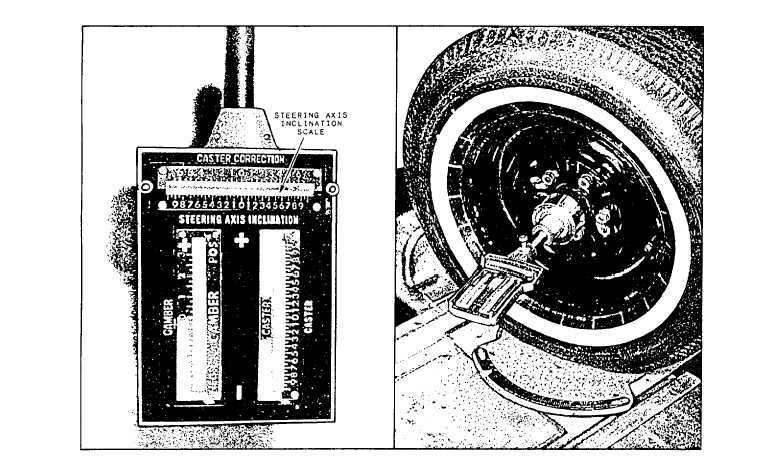 You most likely will find the magnetic caster-camber gauge (fig. 12-9), a set of turntables (fig. 12-10), and a toe-measuring gauge (fig. 12-1 1). These three tools are the essentials. There are a large variety of tools on the market to aid you in making the actual caster, camber, and toe adjustments. Some are necessary; others can be substituted from your kit 13. 1. Inspect the tires for correct size and inflate them to correct the air pressure. If the front tires are worn from misalignment, rotate or replace them. A tire worn on one side or the other will tend to pull to the worn side, even after the vehicle has been correctly aligned. 2. Inspect the wheel bearings, and correct excessive end play before making any other inspections or adjustments. Figure 12-9. - Magnetic caster, camber gauge.